What is the value of a regional Agricultural Advisory Committee (AAC), and what are their challenges and successes? A new research report supported by the Friends of the Greenbelt Foundation and the Golden Horseshoe Food and Farming Alliance explores just that. While farmers make up less than two percent of the provincial population in Ontario, and thus their political influence may be limited, AACs provide an important agricultural lens to local policies, plans and processes. The decisions of local and regional Councils can have direct and immediate impacts on the short and long-term viability of agriculture. Throughout the report, lessons are provided based on the experiences of Committee members. Research was conducted within the Greenbelt/Golden Horseshoe: Durham, Halton, Niagara, Peel, and York Regions and the City of Hamilton. While these lessons are gained from AACs within the Golden Horseshoe, they are also applicable across the province and can be utilized by existing AACs, as well as regions/counties interested in establishing an AAC. 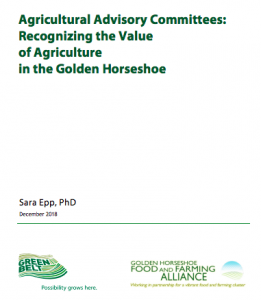 Access the full report here, Agricultural Advisory Committees: Recognizing the Value of Agriculture in the Golden Horseshoe.